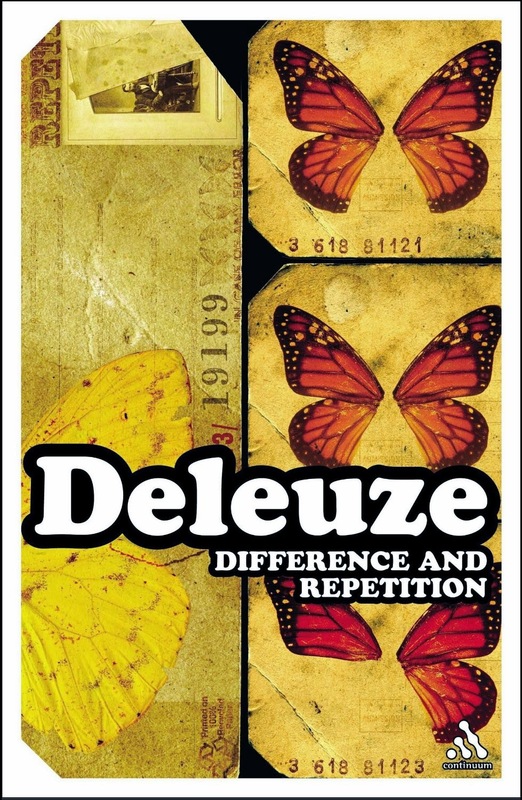 After a string of books on other philosophers - Hume, Nietzsche, Bergson and Spinoza - Difference and repetition marked Gilles Deleuze's first attempt to 'do philosophy' for himself. Repetition is not generality. Repetition and generality must be distinguished in several ways. Every formula which implies their confusion is regrettable: for example, when we say that two things are as alike as two drops of water; or when we identify ‘there is only a science of the general’ with ‘there is only a science of that which is repeated’. Repetition and resemblance are different in kind - extremely so. Generality presents two major orders: the qualitative order of resemblances and the quantitative order of equivalences. Cycles and equalities are their respective symbols. But in any case, generality expresses a point of view according to which one term may be exchanged or substituted for another. The exchange or substitution of particulars defines our conduct in relation to generality. That is why the empiricists are not wrong to present general ideas as particular ideas in themselves, so long as they add the belief that each of these can be replaced by any other particular idea which resembles it in relation to a given word. By contrast, we can see that repetition is a necessary and justified conduct only in relation to that which cannot be replaced. Repetition as a conduct and as a point of view concerns non-exchangeable and non-substitutable singularities. Reflections, echoes, doubles and souls do not belong to -the domain of resemblance or equivalence; and it is no more possible to exchange one’s soul than it is to substitute real twins for one another. If exchange is the criterion of generality, theft and gift are those of repetition. There is, therefore, an economic difference between the two. To repeat is to behave in a certain manner, but in relation to something unique or singular which has no equal or equivalent. And perhaps this repetition at the level of external conduct echoes, for its own part, a more secret vibration which animates it, a more profound, internal repetition within the singular. This is the apparent paradox of festivals: they repeat an ‘unrepeatable’. They do not add a second and a third time to the first, but carry the first time to the ’nth’ power. With respect to this power, repetition interiorizes and thereby reverses itself: as Peguy says, it is not Federation Day which commemorates or represents the fall of the Bastille, but the fall of the Bastille which celebrates and repeats in advance all the Federation Days; or Monet’s first water lily which repeats all the others. Generality, as generality of the particular, thus stands opposed to repetition as universality of the singular. The repetition of a work of art is like a singularity without concept, and it is not by chance that a poem must be learned by heart. The head is the organ of exchange, but the heart is the amorous organ of repetition. (It is true that repetition also concerns the head, but precisely because it is its terror or paradox.) Pius Servien rightly distinguished two languages: the language of science, dominated by the symbol of equality, in which each term may be replaced by others; and lyrical language, in which every term is irreplaceable and can only be repeated. Repetition can always be ‘represented’ as extreme resemblance or perfect equivalence, but the fact that one can pass by degrees from one thing to another does not prevent their being different in kind. PDF of the introductory essay here.